Timothy Gagnon is the faculty director for the D’Amore-McKim School of Business Online Master of Science in Taxation program. In this video, he discusses the taxation program, his teaching philosophy, and how all students can customize their Online Master of Science in Taxation for their career goals. I’m Timothy Gagnon. 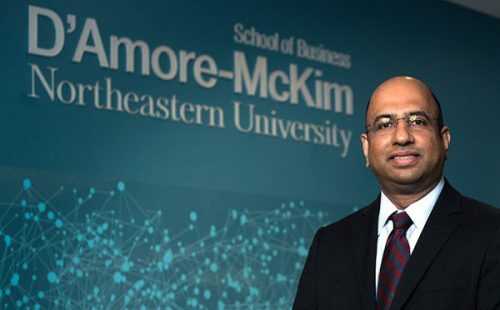 I’m an Assistant Teaching Professor and the Faculty Director for the Master of Science in Taxation for the D’Amore-McKim School of Business. For the online program, I teach the estate and gift taxation and tax research. Estate and gift is really the other side of what we give away, how to account for it in the tax system and then that interrelates is now that you’ve died what do you have left for credits, what’s included in your estate, what’s not included and how do we pull back under the IRS code? How do we pull back certain assets into your state to get the full value to determine who do we charge in estate tax. I spend my time trying to teach people, or my students, how to research through the tax code, whether it be the statutes, the administrative regulation, or the difference in cases. The online taxation program is 10 courses. There are five core courses that you must take and then you have five electives. We’ve tried to arrange the electives to be what we call a corporate track and an individual track, but you’re not held to only taking the corporate track or the individual track. You can take five electives out of either one of the tracks. The whole idea being that we’re wanting you to become more tax efficient, the core courses will do that, corporations, partnerships, estate and gift, research, federal taxation issues. Those are the core because you need a broad base. But when it comes to your electives, you can take them in advanced partnerships, you can take them in income tax and trust and states. You can mix and match because we really want you to be able to take courses that refine more of the area you wanna know about or would be more advantageous to your practice in the future.